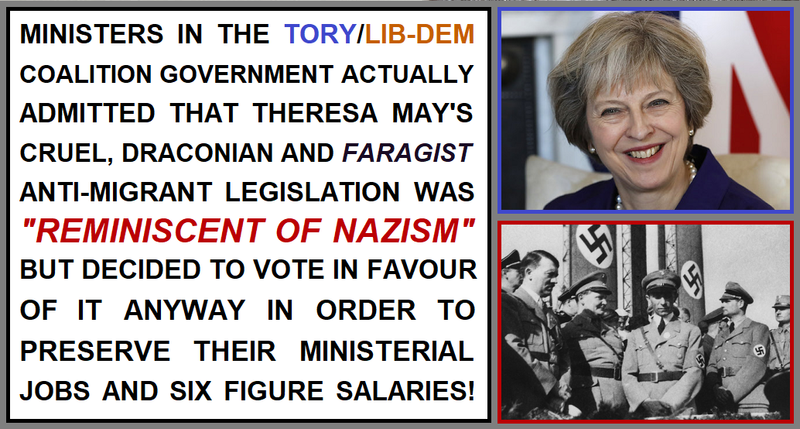 Senior government ministers likened Theresa May's anti-immigrant legislation to Nazism, but voted in favour of it anyway! In 2014 Theresa May introduced the draconian new anti-immigrant powers that the Home Office have subsequently used to dehumanise and persecute the Windrush generation. These grotesque Faragist rules have been used to deny employment, deny housing, deny health care, and deny social security/pensions to British Windrush citizens, and to make thousands live in constant fear of imprisonment and deportation by their own country. The parliamentary record makes it clear that a few brave MPs dared to stand up against the tide of extreme anti-immigrant rhetoric to criticise Theresa May's plans, and vote against them. Diane Abbott was amongst them, and she had the intelligence and foresight to predict that May's rules could be used to attack British citizens without documentation. The breaking of the Windrush scandal has proven her concerns to have been incredibly prescient and well-founded. 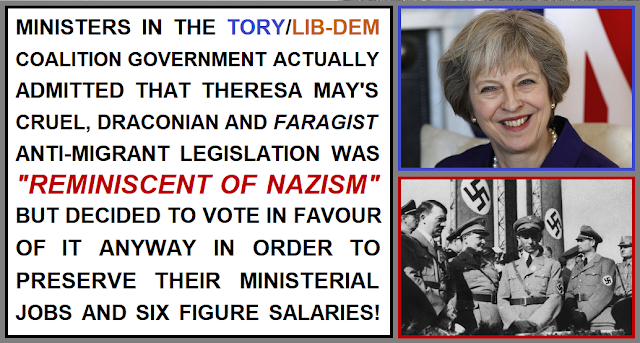 What we didn't know at the time was the secret behind the scenes debates within the coalition government, but in the wake of the Windrush Scandal the senior Civil Servant Bob Kerslake has claimed that some ministers in the coalition government were so concerned that they described Theresa May's new law as being "reminiscent of Nazi Germany". Even more shocking than the revelation that senior government ministers were likening their own government policy to that of the Nazis, was the fact that they just bit their tongues, raised no concerns in public, and then went ahead and actually voted this Nazi-style legislation into law when it went before parliament. They knew they would have to resign their ministerial positions if they stood their ground and voted against it, so these disgusting self-serving bastards actually voted in favour of a bill they'd privately likened to Nazism for pure political expediency! 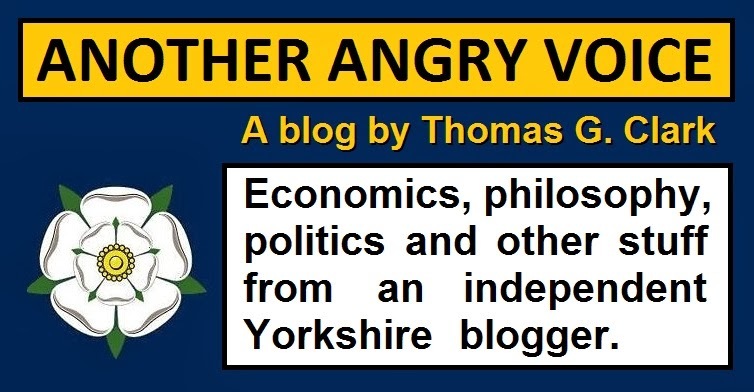 The New Labour mob covered themselves in shame too by whipping their MPs into abstaining on Theresa May's Nazi-style immigration witch hunt, while only six principled Labour MPs did the decent thing and opposed it (Jeremy Corbyn, John McDonnell, Diane Abbott, Dennis Skinner, Mark Lazarowicz, Fiona Mactaggart). This shameful abstention from Labour just goes to show how hopelessly lost they had become in the late New Labour years, but the truly horrific thing is that there were cabinet members in the Tory/Lib-Dem coalition who recognised the fascist intent of Theresa May's bill, but voted in favour of it anyway because they wanted to keep their six figure ministerial salaries. Perhaps the most worrying thing of all is how far Britain has managed to progress along the road towards totalitarianism with the majority of people not even noticing. Not only was Theresa May allowed to get away with introducing this vile Nazi-like legislation back in 2014 because members of her own government were too self-serving to speak out, and because of the pathetic abstentionism of the timid and directionless Labour leadership at the time, but this legislation has been allowed to fester away, destroying peoples lives for over four years, and the vile wannabe-tyrant who created it has actually been promoted to Prime Minister!